Salt and pepper caramel brownies – rich chocolate brownies get a hint of spice from a hefty dose of black pepper, enhancing their absolute decadence. There is never not an excuse to pat yourself on the back with chocolate, and guys…we just made it through a WHOLE WORK WEEK! And we didn’t even fall asleep at our computers !!! Not even once!!! (Even though we sometimes really really really wanted to). Can I offer you a brownie in congratulations? Because, EARNED IT. And these are not even your average brownies. These are the richest darkest decadent-est brownies with a deep dark black pepper spice secret, topped with a salty caramel ooey gooey layer of sheer goodness. Deep breaths. They overwhelm me too. 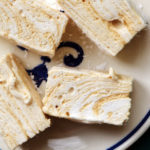 The black pepper is a surprising addition, but just as it enhances flavors in savory cooking, it does the same in sweets, somehow making the chocolate taste more like CHOCOLATE. On steroids. It brings a bit of heat as well, but the kind that makes your tongue burn with longing and lust rather than discomfort. Let the love affair begin. Salt and pepper caramel brownies - rich chocolate brownies get a hint of spice from a hefty dose of black pepper, enhancing their absolute decadence. To make the brownies, heat oven to 325. Grease an 8-inch square baking pan, line with parchment paper, and then grease the paper. Set aside. Whisk together the flour, cocoa powder, pepper, and baking powder in a medium bowl. In a large bowl, whisk together the brown sugar, vanilla, salt, and eggs. Add the melted butter to the sugar mixture and whisk until smooth. Fold the flour mixture into the wet mixture. Pour the batter into the prepared baking pan and bake until just set, 24-26 minutes. Set on a rack to cool. Meanwhile, make the caramel. Add the water to a medium saucepan. Add the sugar to the pan, making sure it is moistened with the water. Cook over medium heat, without stirring, until the caramel is a medium amber color, about 5-6 minutes. Slowly stir in the cream, whisking constantly. Add the butter and cook, whisking constantly, until smooth and slightly thickened, 2-3 minutes more. Whisk in the vanilla. Pour the caramel over the brownies and spread evenly. Let cool, in the pan, for about 10 minutes. Sprinkle with fleur de sel and refrigerate until set, about 1 hour. My husband jokes that I put pepper on everything, but even I haven’t thought to use this. But I guess, chilli goes well with chocolate, so no reason why pepper wouldn’t. OMG. 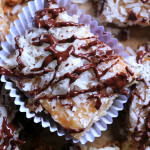 These look soooo ridiculously decadent and perfect! Black pepper?!! I never would have thought of that, but girl you totally sell it. I am dying to try these!!! Especially with that caramel on top, wow. They look INCREDIBLE. Congrats on getting through 5 days!! I took Monday off so technically only got through 4… Plus I may have fallen asleep at my computer a few times 🙂 Anyyyyway, I LOVE that there is black pepper in these! They look so delicious! Hmmm – as I so often say: wish I had some of those right now! Yum. As if I wasn’t already happy that it’s Friday. Now these brownies? I can’t stop staring at them! Hmm… I’m definitely intrigued by the black pepper in these… might have to tone it down for the kiddos, but I’m game! The black pepper is definitely an intriguing ingredient!! Admittedly, I’m a little nervous about including it, but these look so amazing. 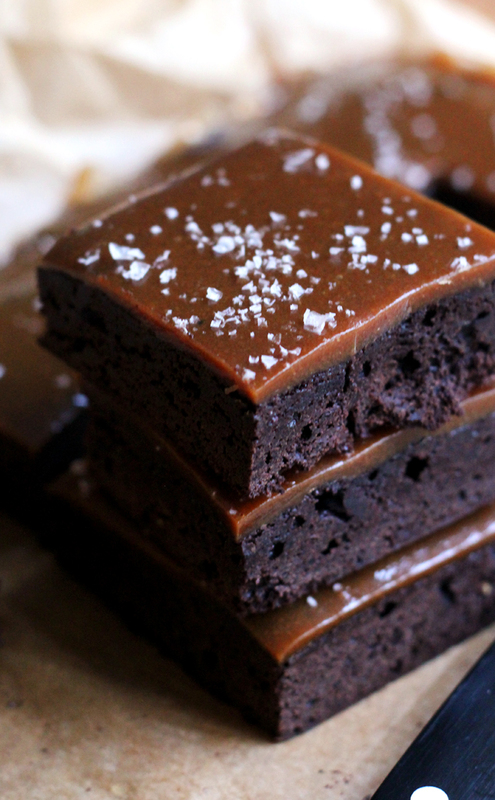 Pass me a stack of salt and pepper caramel brownies! These look fantastic! I’m intrigued by the black pepper! Definitely have to give these a try! Pepper in brownies? Sign me up! Chocolate on steroids? I am in!!! I love love that you added pepper and gooey caramel to the top layer. Hello new favorite brownies! 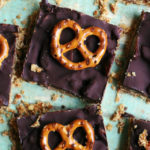 These brownies look utterly delicious, esp. with that glorious layer of caramel! All I can say is, OH MY. They are swoon worthy and beautiful. I am seriously wanting one (or three) right now. These sound amazing Joanne. Just the thing for busy weeks! (And I guess they’d improve relaxed weeks too 🙂 ). Pepper in brownies? Well if salt works, why not pepper?! Such a cool idea- these look fabulous 🙂 Pinning! Wow – these. look. AMAZING! What a great idea. I’m pinning to try for sure. They sound so good! Oh my gosh. This is EVERYTHING. 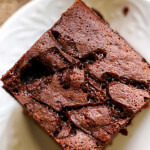 Brownies are my absolute favorite dessert, and pepper is a must-have in our house! I would have never thought to combine them, but I LOVE where your head’s at! Hello, my pretty! I am a firm believer in peppering almost everything but I would have never through to add it to brownies. Love the idea! Oh man these brownies are proof that dreams do come true… (or they would if you invited me over right about now). YUM! 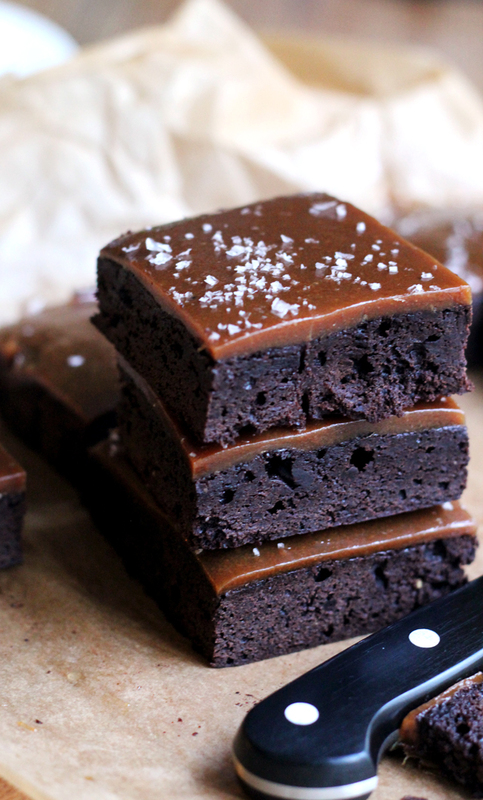 Whoa, these brownies are everything! So creative to add the black pepper!The gooey salted caramel topping is totally calling my name! These brownies look amazing. I have never thought of putting pepper in brownies before, but I see that it works. This would be the perfect treat after a hard week of work. I’m really too hungry to be looking at these right now. They are the richest looking brownies ever … and yet I want the whole pan. Hi Joanne, I love caramel and chocolate, I bet these are delicious! Pepper and chocolate, salt and caramel…oh yes! I’ll be craving these until they get baked. 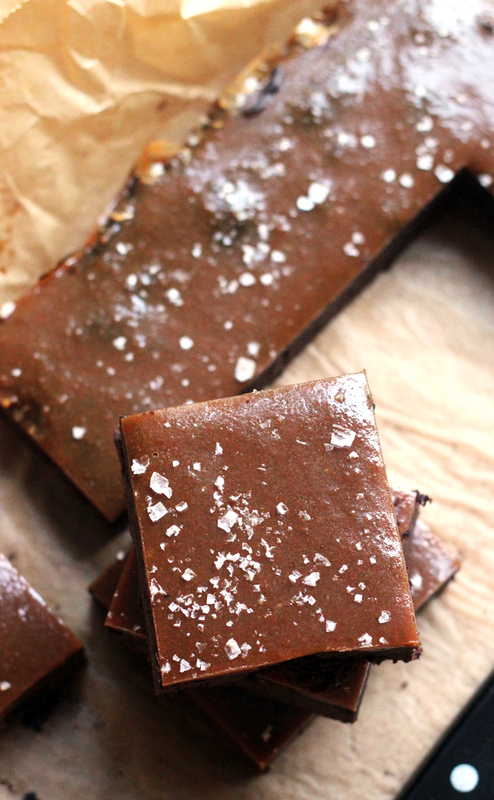 Hi Joanne, these look so fudge and indulgent… salty, sweet, and spicy! These are kind of mesmerizing! I love that perfect thin layer of caramel on top…just the right about. my taste buds don’t know the rules. they prefer me to put sugar in savory things and salt and pepper on sweet things. i can’t believe i haven’t tried this, but i will do so posthaste! holy high heavens……so decadent! I love the sea salt and the caramel and omg I bet the pepper adds such an interesting depth! Salt and pepper in brownies? It sounds exotic. Loving this fabulous idea, Joanne. This is mouth-watering good.